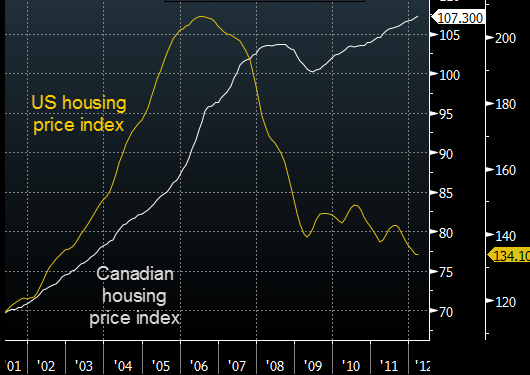 Sober Look: Is Canada facing a housing bubble? Is Canada facing a housing bubble? As discussed before, risk management, whether in banking or among regulators and consumers tends to "fight the last war". The "riskiest" asset class in people's minds is generally the one that got the most attention in the previous down cycle. In the 2007 recession, the US residential property market was the hardest hit among the various asset classes. As a reaction to that event, lenders in the US are being fairly conservative in providing residential mortgages. Home buyers on the other hand are in no rush to buy properties. The risks associated with real estate markets are still on everyone's mind and will probably be for some time. That type of risk aversion keeps asset bubbles from forming. Canada on the other hand did not experience the same level of housing bubble nor the correction that followed as did the US (see chart below). Therefore housing in Canada does not tend to conjure up the same connotation of risk as it does in the US. At least not yet. 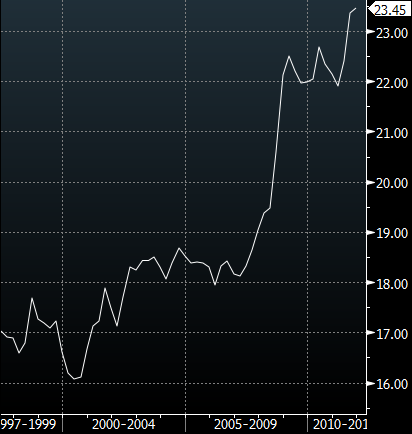 Canadian home prices have been growing quite rapidly, particularly as compared to the US. Some may argue that this is justified because Canada's unemployment rate is lower. 8.1% in the US vs. 7.4% in Canada. Is that enough to justify such a divergence in housing prices, particularly when the GDP growth rates in the two countries is fairly similar? 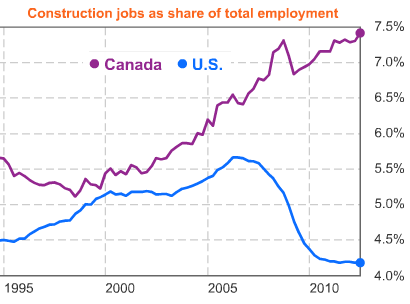 In addition, construction in Canada is booming. The chart below compares construction jobs as a percentage of total jobs for the US and for Canada. The divergence is quite striking. Canadians have also been growing household debt levels. 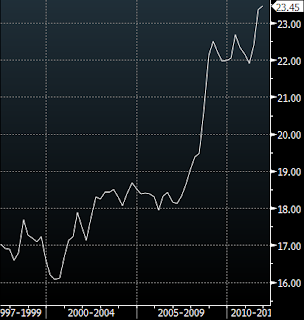 The chart below, though a bit dated, includes mortgage debt (total debt as percentage of net worth). 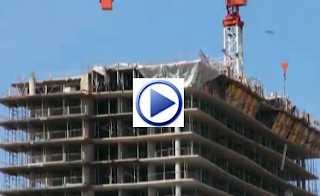 Edmonton Journal: - ...OECD economist Peter Jarrett ... described the housing market as the “biggest story in Canada.” Home prices, which corrected about 10% during the recession, have surged again, “making household balance sheets look increasingly fragile, he said. Given the global economic backdrop, and in particular the sharp correction in energy prices to which Canada is highly exposed, the risks of a Canadian housing correction are rising. Watch the BBC video below to get a feel for the situation on the ground.